Can you deliver my rug? Do you stock oversized rugs? Can you source rugs or create bespoke designs? Where do you source your rugs? Are all Persian rugs investments? What should I look for in a rug? Where is my rug from? Can you give me a value on my rug? How do I hang a rug? What do I do if my rug is damaged? Do you buy or exchange rugs from the public? Why is there leather on the sides of my rug/your rug? Little-Persia has Scotland's most comprehensive range of hand-knotted rugs. We have over 1,200 unique hand-made rugs in stock from Iran, Afghanistan, India, Pakistan, China and Turkey giving us one of the widest ranges of handmade rugs in the UK. We also repair rugs here in Glasgow, we can deal with minor tears and holes as well as fringe damage and wear or unraveling to the sides (selvages) of the rug. 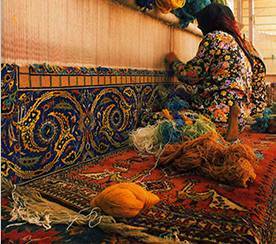 For more complicated work we are able to send rugs back to Iran to be repaired by master weavers. Little-Persia also perform professional handmade rug cleaning on-site at our Glasgow gallery, we only deal with hand-knotted rugs giving you the piece of mind your rug gets the care and attention it deserves. In 2010 we will be selling more contemporary rugs and machine-made rugs through our sister website www.love-rugs.com. Little-Persia offer a 14 day money-back guarantee. Customers also have the option of taking rugs for a free home trial to ensure it fits well with the size and décor of their room before purchase. If for ANY reason you are not happy with your purchase and wish to return your rug, Little-Persia provides a 14-day full money back guarantee (minus delivery costs - which are typically small) or a replacement rug of your choice. There will not be any handling/restocking charges unless otherwise stated or the rug has been used and cleaning is required. If you are unable to return the rug yourself, Little-Persia can arrange a convenient date to uplift the rug from your home. The rug should be securely packaged for transport; furthermore the rug must not be damaged in any way. See rug delivery for further details. We accept debit cards, most credit cards, cheques, banker's drafts, cash and bank transfers. If you have another method or means of payment please ask. We offer free home delivery on rug purchases within mainland UK. If in-store, the majority of rugs are easily rolled or folded and able to be taken by car. Outside the UK please contact us for details. Next day delivery is available during the week - see rug delivery for details. Saturday delivery is an additional £20. Yes, we are VAT registered (VAT no: 735186228) all prices include UK VAT at 20%. We are open 7 days a week. Opening hours can be found here. Just across the River Clyde from Glasgow city centre. Further information, map and directions can be found on our contact page. There are single yellow lines on the street that our shop is on so you can park here for a limited time (after 4pm the street becomes a no loading zone). There are also several car-parks nearby including one at Remnant Kings just across the road. Our largest rug at the moment is 18ft (5.5m) long by 12ft (3.6m) wide. We can also source larger handmade rugs to order which normally takes between 2 and 4 weeks. This service requires a 15-25% deposit. In 2012 we sourced a 9.5m x 6.5m rug in 2012 so any rug of any size is possible. Little-Persia is able to source a wide variety of rugs to order; we have a wide network of contacts in Iran, India, Afghanistan and the surrounding countries and try our best to find a rug from a bazaar that will fit your needs. We also have contacts in London, Germany and the US who are often able to provide us with rugs to suit your requirements. This is often a faster approach but can be more costly as these suppliers need to make a profit. We recently sourced a 68m2 rug for the Faculty of Advocates in Edinburgh so rugs of any size are possible. It is normally possible to produce a rug if you have a design/artwork. Please note this can take several months and generally costs more than sourcing a rug direct. Originally most of our rugs were from Iran (Persia) however we now also stock a wide rage of rugs from Afghanistan, Turkey, India, China and Pakistan. Rugs from Iran are known as Persian rugs, beware of rug dealers who sell all their wares as "Persian" as they are likely to be selling Indian or Pakistani reproductions of Persian rugs as authentic Persians. Also note that there is nothing wrong with these rugs, some are extremely high quality, but the practice is misleading particularly as often Persian rugs' market value is higher than a comparable Indian or Pak-Persian rug. This really depends on the knot count or knots per square inch (KPSI) and explains why this is an important indicator of price. It also explains why Persian and Oriental hand knotted rugs are so exclusive. A skilled weaver can knot around 12 knots per minute, to find out how long your rug took to make use our simple calculator. Rugs with more colour and detail will also take longer to weave. A 224 KPSI rug in all the one colour (a plain pattern) will take a lot less time to weave than a 224KSPI rug with multiple colours (giving it a more intricate design). This is simply because following a complex pattern is more difficult and changing colours is more time consuming for the weaver. This does not include the time taken to shepherd, spin and dye the wool, nor to design, wash, dry and clip the rug. Often a couple or a family will share the work for tribal rugs or two weavers will simultaneously knot a city woven carpet halving the time taken to complete the rug. However, the man hours/days going into the production remains the same. Information on the process of rug weaving along with a slide show of the process is available in our Making A Rug Guide. No. 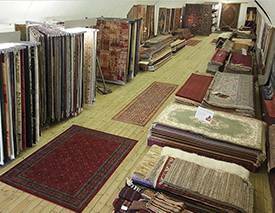 Many rugs will hold their value and some will increase but this is not the case for all rugs. It is true that the price of handmade rugs is increasing as less and less people are introduced to the art of rug weaving however not all rugs are of good enough quality to be considered an investment. This being said, a good Persian rug will likely only increase in value as the cost needed to reproduce it will continue to soar. Condition, colour, design and age are all important when considering a rug solely as an investment. A major attraction of Persian rugs is they are an art form which is beautiful yet robust. It is impossible to predict how long a rug will last but quality pieces can last for over 100 years while in use. One of the major benefits of hand knotted rugs over machine made rugs is that the wool does not tend to shed as much as the knots are secure. Depending on the level of traffic, quality of the rug and the level of care it receives your rug could last anywhere from 20 to 200 years. Rugs held by collectors and sold for hundreds of thousands or millions can often be several centuries old. It is most important to go for something you like, however, if you wish to find out more about what to look for in a rug take a look at our rug guides and 'choosing a rug' page. For most people it is best to establish the minimum and maximum size in both length and width and possibly the colour scheme before coming in to view the rugs. Our range is massive so it helps to be able to narrow it down in any way possible. In saying that, in our experience many people come looking for a light coloured rug and try many in their home before finding a darker rug is perfect (and vice-versa) for their room. Some like rugs which have been implemented perfectly; others find rugs with an abrash colouring or imperfections to be more charming and authentic. While there are ways of establishing the quality of a rug, for instance using knots per square inch, however when talking about design there is no such thing as the perfect rug - there may be a rug which is perfect to one person yet disliked by another - it comes down much to a matter of opinion. Where is my rug from - is it Persian? If you have a handmade rug and wish to know where it originated email us a picture or bring it to the gallery and we will do our best to determine the rug’s origin. We will give your a free verbal ball-park figure of the value of your rug based on its retail replacement value (how much it would cost from a rug retailer). We cannot give you a 'sale' value for your rug is this is impossible to judge, if you are looking for a quick sale our advice would be to get estimates from various auction houses. Bring the rug in or simply send us some detailed pictures along with information on what you know about it, its size, where you got it etc. For insurance claims Little-Persia offer a written valuation service for £40 plus vat, we have successfully worked with a number of insurance companies in the past to get customers a fair deal on their damaged rugs. This fee will be deducted should you buy a replacement rug from Little-Persia. We supply clips to hang rugs, another option is to frame the rug behind glass and/or use a Velcro backing. When hanging a rug on the wall ensure it is not exposed to damp, it is best not hang large and heavy rugs without professional help. Take it to a rug specialist! The longer damage is left the more likely it is to spread. 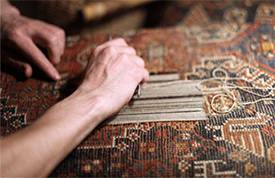 At Little-Persia we carry our repair work on rug fringes, selvages (sides), holes and tears. Recently, with the help of our ex-weaver repairmen we are able to re-knot areas of rugs and repair moth damage and extend core fringes here in Glasgow. For larger repairs taking weeks or months it may be more cost effective to send the rugs back to Iran for repair. Due to the level of work and transport costs this process can be expensive so is only recommended for high quality rugs. For more information on caring for and cleaning your rug take a look at our rug guide page. For information on the repair service we offer see our services page. Yes, however not all rugs will interest us, do feel free to send us pictures and give us a call and we will be as helpful as we can. Follow our instructions for sending pictures on our rug services page for more accurate results. 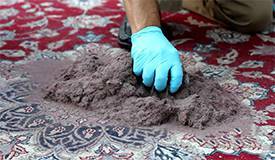 Remember that for us to buy a rug we will often have to have it professionally cleaned and occasionally repaired in Iran, then we have to be able to make a profit when and if we sell it. What is the most expensive rug ever sold? It is difficult, if not impossible, to know what the most expensive rug ever sold was. Around the world there are many private sales and it may well be that the most expensive rug has changed hands during one of these sales. At public sale the title of most expensive rug was briefly held by 'the Isfahan rug', a 500 year old silk piece which sold for $4.5m in 2008. However at the beginning of 2009 a jewel encrusted rug with an estimated two million 'barsa' pearls along with other precious stones was sold at auction fetching over $5.5m, smashing the previous record. That being said, the sale was a disappointment to the auctioneers who had hoped to raise up to $15m. In our eyes the Isfahan rug should have probably still be considered the most expensive rug sold as the Barsa rug, made from pearls and precious stones is not as authentic and more of a publicity stunt. On 15th April 2010 a new record was set at Christie's King Street auction, London. A Kirman vase carpet from the 17th century known as the 'COMTESSE DE BEHAGUE VASE CARPET' was sold for £6.2m ($9.6m) smashing the previous record. Little-Persia has been commissioned to create a pixelated version of this rug by an artist and will carry out work in 2013. The world's largest and most expensive rug to make is no doubt the one woven for the Sheikh Zayed mosque located in the United Arab Emirates. With over 1,400 weavers involved at different stages it took more than two years to make and covers over 60,546 square feet, that's over 2.2 billion knots! It is estimated to have cost around £8.5m to knot in wages alone. Some rugs have leather straps sown on the the sides of the rug on the reverse. Sometimes people worry that this is a sign of something being wrong. It is not. Having leather up the sides is something most newer Persian rugs have and something which is a benefit to the rug. This prevents the rug from becoming mis-shaped over time and holds it straight. It also means it sits better on the floor. So it is a plus point on a rug and not something to worry about, although not necessary. We can add this to rugs which do not have it for a fee.